This plate was taken from an estate which had a great many antiques acquired through family generations. This is one of a group of three antique Japanese porcelain plates, each one showing a different scene from Imperial Japanese life. Porcelain characterized by a blue glaze. We have collected the all kind of Japanese antiques. The item has a Wooden box. We are happy to understand you the matter. We will make every attempt possible to resolve the issue if we made a mistake. STORAGE WOOD BOX IS OPTIONAL. & MIDDLE EAST. also to get proper amount of compensation in case of item breakage. Porcelain characterized by a blue glaze. We have collected the all kind of Japanese antiques. We are happy to understand you the matter. Worst two months. We will make every attempt possible to resolve the issue if we made a mistake. Japanese Imari Porcelain Pin Dish Plate with 4 Characters. AGE: C1900s-. also to get proper amount of compensation in case of item breakage. IF YOU PREFER CHEAPER AND SLOWEST " SURFACE ". 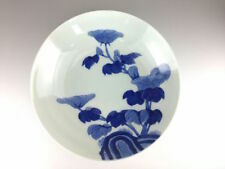 A dish decorated in underglaze blue with a continuous Lotus vine arabesque, Karakusa, border consisting of five repeats of a Lotus flower with auspicious Gobenka scattered amongst the leafy vine. The reverse is decorated with a languidly flowing karakusa arabesque of four repeats with a gobenka flower motif. It is rare style. Of course, this is hand-drawn work. And the work, painting style are appropriate Imari. It has a long history. Origin is a 17 century. And it is also famous as the birthplace of Japanese porcelain. Porcelain characterized by a blue glaze. We have collected the all kind of Japanese antiques. Dragon Flower Arabesque pattern. Blue and White ceramics. Worst two months. Color / Blue. Condition : Good. Large Japanese Imari bowl, late 19th century. Large Japanese Imari bowl. Size: Ø ca. 22 cm. Height: 9,5 cm. Condition: only one small rim fit and a hardly visible small hairline of 4,2 cm. 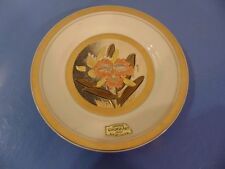 DESCRIPTION This is Antique Kutani ware flower pattern plate of edo era. There is a signature. (kutani) The flower pattern is very beautiful. It is an plate with a very good appearance. The state is very good , considering the age. *There is a possibility that a color of the photograph and an actual color are somewhat different. SIZE (about) 21cm×2cm (8.26inch×0.78inch) total weight: 344g Condition: used / The state is very good , considering the age. JAPANESE KUTANI. NAKAMURA ZO. MARKED : DA NIPPON. There is a small chip on the edge of one of the plates as shown in the pictures. I am not very knowledgeable in this area but believe this is Japanese. A very nicely decorated Japanese Porcelain plate. For China (& rest of Asia) & US allow at least 2 to 3 weeks. Depending on the situation it can take up to 1.5 month. 18th century. Overall Condition Perfect. Earthenware tray-like vessel in the shape of a basket with handle. On one side with triangular openings. The right half covered with the typical green glaze, covering the handle, as well. The handle is engraved, so as to simulate a rattan wrapped handle. Large 16" Antique Hand Painted Japanese Imari Scalloped Edge Charger with Wooden Display Stand. 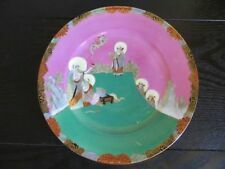 I believe this plate is from the Meiji Period (1868-1912) but can not be sure. A pair of Japanese Imari plates, flower basket decoration, late 19th ct.
A pair of Japanese Imari plates with flower basket decoration. Late 19th century. Size: Ø 21.4 cm. 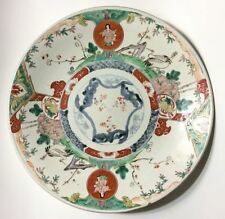 ANTIQUE JAPANESE IMARI PORCELAIN CHARGER 14 3/8"
Age: 18th century. Condition: Very good, only a short hairline in the rim. Tick the box and save! If you are interested in a specific item, dont hesitate to ask us, we'll do our best to find it for you. Antiques & Collectibles from Shangri-La is Made For the Art of Collecting. This beautiful kimono is embroidered with cranes and floral including bamboo, plum, and pine, also known as "sho-chiku-bai" or the "three friends of winter.". Together they symbolize resilience, steadfastness, and perseverance. Nice condition. Has red stamp / mark of the famous Tezuka Kinsei. Made by ARITA, KAKIEMON. Lovely IMARI colors. Circa 1750 -1780. The quality of hand painting is outstanding. All original, no restoration. Size: 111/4" by 1 1/2" H.